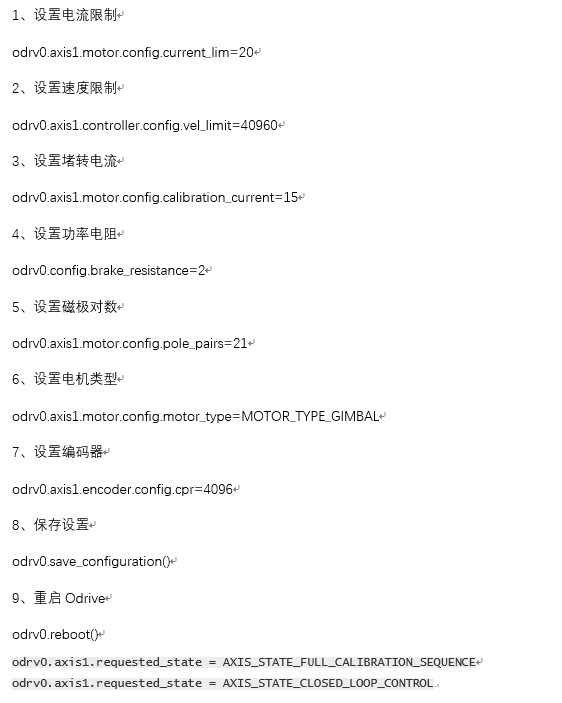 hello!Friend!I have some problems with odrivetool.I am usingT motor and AMS encoder 5147 followed the instructions in the getting started guide to connect everything.Does odrivetool support such motors and encoders? Hi Lao, the Troubleshooting page of the getting started guide has some notes on what the different error codes mean: https://docs.odriverobotics.com/troubleshooting. The ODrive should support the 5147, at least in incremental mode (ie connecting A,B,I,5v,GND). The troubleshooting page of the getting started guide has some comments about the meaning of different error codes, but there seems to be no corresponding solution.Can you tell me what the 0x0080 error of the motor is? After connecting the ABI line, the board cannot properly recognize the index signal. Could you help me ? I have some problem with configuring the parameters. 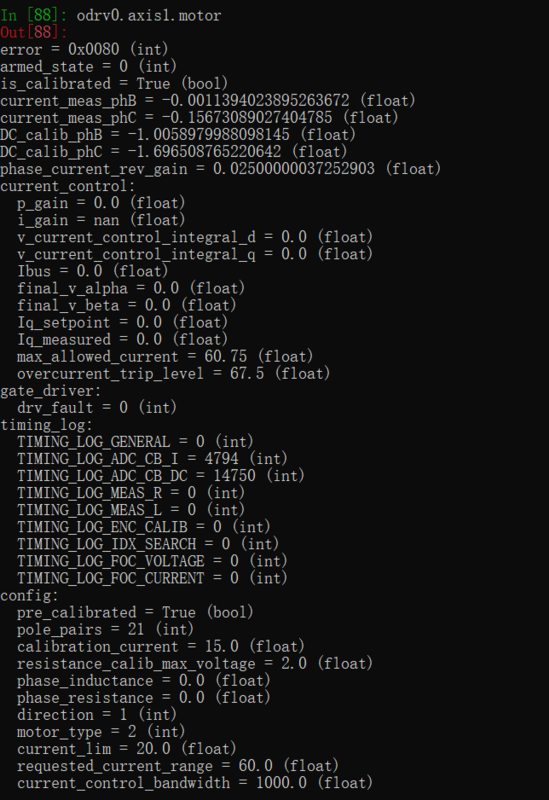 This is the parameters which I configure. Then I look at the parameters of the motor and the encoder. This is the result of them. If I’m not mistaken your error 0x0080 (int) corresponds to ERROR_BRAKE_CURRENT_OUT_OF_RANGE (0x0040) and ERROR_CONTROL_DEADLINE_MISSED (0x0010). Unfortunately I don’t know what the brake current out of range error means, or how to fix it, but someone on the forum might know. My only suggestions would be to test without the index signal, and to make sure you are in fact using a gimbal motor. The top of the Troubleshooting page has a small paragraph on decoding these messages. 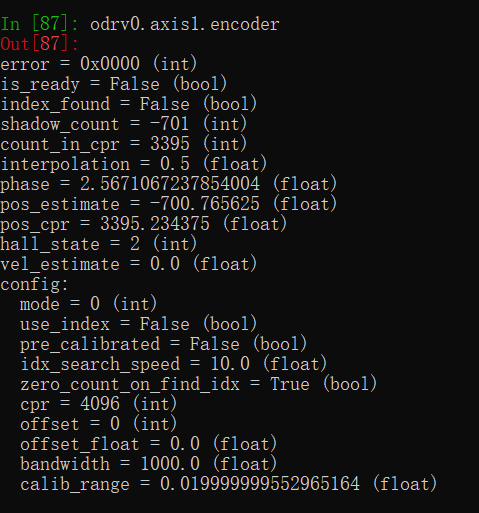 Essentially you’ll want to convert the code to hex, then look at the motor.hpp file (linked in the Troubleshooting page), and finally figure out the two error codes that sum to what your error code is in hex. It is actually ERROR_MODULATION_MAGNITUDE. Have a look at the Troubleshooting page.